Well, on the surface, it's an entertaining platform for content creators to share hours of their work with a dynamic audience in real-time. But Twitch, particularly when it comes to poker, isn't used solely for entertainment (although entertain it does). It's also being used as an educational tool, helping thousands of viewers interested in learning poker and improving their games do exactly that. All for free, mind you. More importantly, though, Twitch provides a community comprised of thousands of different personalities, all brought together through a shared interest, and kept together by the streamer on the other side of the screen. That sense of community is tangible, and really does help people. We saw all of this on Sunday night. 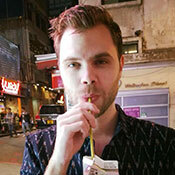 While both Ben "Spraggy" Spragg and Lex Veldhuis were streaming on their respective Twitch channels, each of them deep in big events (be it the Sunday Million or Turbo Series Mains), a viewer named "Goldennn" made his or her presence felt. "I just finished second in the $22 #105 Turbo Series event for a huge, life-changing score," Goldennn wrote, having made a huge £50 donation to Spraggy. "I want to give back something, since you've taught me a lot and kept me entertained through bad times. "Keep doing what you do best. Thank you so much." Spraggy, unsurprisingly, was taken aback. "What a heart-warming message," he said. "Shout out to Goldennn, for the £50 dono. Wow. That is no joke. Mate, thank you so much, and a huge congratulations to our good friend Goldennn, who is around the stream a lot. I've battled with him on the felt fairly regularly, and today he got second-place in the $22 Turbo Series!" The tournament in question was the Turbo Series #105: a $22 6-Max Progressive KO with $100K guaranteed. After a huge field of 10,198 entries took their shots, that prize pool swelled to more than double ($203,960). Six hours and 15 minutes later it was all over. Lithuania's Goldennn (known on PokerStars as "G0lD3NAS") finished second following a three-handed deal with the eventual winner, Germany's "SkyyBluee", and third-place finisher, Slovakia's "ZuzanaM". You can check out the final table results below. After such an amazing result, Goldennn was quick to show gratitude to the streamers who not only entertained and educated, but also provided that community. Having already paid Spraggy his dues, Goldennn also wanted to let Lex know how much he'd helped. "Holy sh*t," said Lex. "That is f**king amazing Goldennn, thank you so much. You guys are tearing Turbo Series apart! It's crazy!" The player who pipped Goldennn to the post, SkyyBluee, then appeared with a donation and message of their own. "Sorry Goldennn, just had to win the $22 Turbo Series event buddy, was an amazing run and incredibly fun. Get 'em in the $1K Lex!" Two players, 1st and 2nd in a Turbo Series event, both members of the same Twitch communities. That's what Twitch Poker is all about.